Martingales are probably the most common training devices used today. Properly adjusted, they can compensate for a green rider’s hands, help teach the mule to give to the bit and keep the mule’s head safely under control. There are two basic types of martingale – those that have a fixed position and those that adjust with the rider’s hands. Each has benefits and drawbacks depending on the situation. Choosing the right martingale for the job, and knowing how to properly adjust it, makes the difference between a training aid or a useless piece of equipment, or even worse a dangerous situation. The most basic type is the standing martingale, or the tie-down as it known to the Western rider. 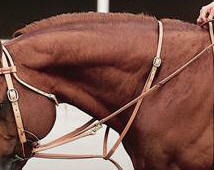 The standing martingale is a fixed length that goes from the cinch, up between the forelegs and attaches to a noseband. Some versions have a strap around the mule’s neck, or run through a ring on the breast collar but the main feature is that it is a static length and can not be adjusted by the rider’s hands. Standing martingales are particularly useful in situations where the rider might not have fine control of his hands, such as jumping, roping or speed events. The standing martingale or tie-down should be adjusted so that the mule’s head can be held in a comfortable normal position at all gaits, and the downward pressure on the noseband comes into play if the mule tosses his head or tries to raise it above the bit. An overly short tie-down can cause problems by forcing the mule into an unnatural position while working, which can create soreness and stress injuries. Also, there are times when it is vital that the mule be able to raise his head – if a mule stumbles, for example, he will toss his head and neck up to help regain his balance. If the tie-down interferes with this, the mule could fall. A too-loose standing martingale does nothing to help the mule and becomes just another piece of equipment that can Useful with mules who carry their heads too high and with the mule who throws its head backwards endangering the rider. 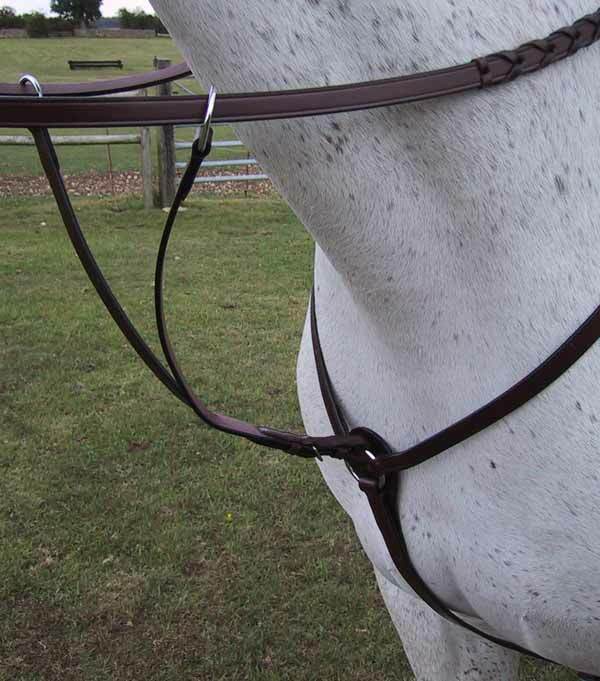 A correctly fitting martingale allows the mule complete freedom of head and neck when performing. 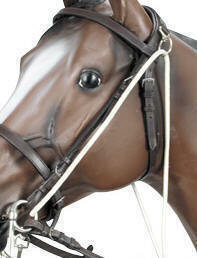 Should never be fitted to a drop noseband which would interfere with action of the bit. Used with a snaffle. Running martingales consist of two rings through which the reins are threaded. The rings are held on a strap that attaches to the cinch or breast collar. Sometimes there is a neck strap. If not the martingale is called a “training fork.” Adjust the strap so that when the mule’s head is in an acceptable position, there is no downward pressure, but if the mule raises his head and neck, the rider can apply some rein pressure and the rings will direct the pressure downward. The rider, by tightening or releasing the reins while riding, can control how much and how long the pressure from the martingale is applied. 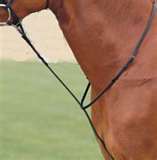 Running martingales are usually used with direct pressure bits such as ring snaffles. Be very careful about using either running or German martingales with curb bits. Also, always use rein stops with a running martingale. If the snaps on the reins become hooked on the sliding rings, a mule could panic and fall or rear. I routinely use running martingales on colts, so that if a problem happens I will have a tool ready at hand to help me regain control. I adjust my martingale so that it only comes into play if the mule’s head is extremely high. Designed to create a steadier feel of the bit in the mule's mouth even with head movement and attempts at evading the feel of the bit. Helpful on green animals who have yet to learn to seek the bit and feel comfortable with a steady contact. Encourages a steady head carriage and gives the rider a bit more control during disobedient sessions. Used with a snaffle. 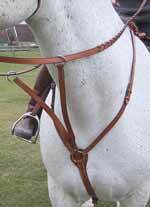 German martingales are the most complicated of the martingales, but also the most sophisticated. Instead of simply sliding the reins through rings, the German reins actually split (usually achieved by hooking the martingale part of the reins to rings sewn onto the direct reins). This second pair of reins continues through the ring of the snaffle, and on down to the cinch. 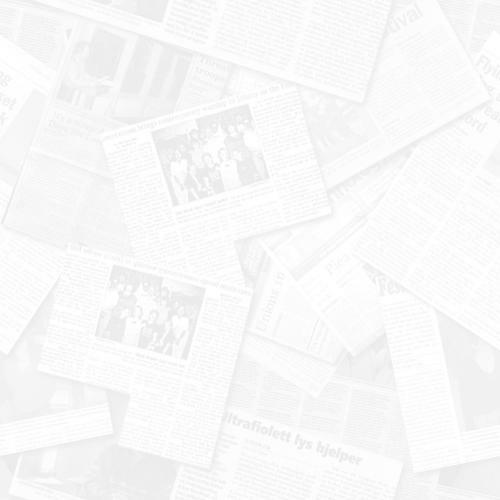 The advantage is that when the mule is responding correctly to bit pressure, there is no martingale effect, but if he raises his neck the martingale reins immediately come into play. When properly adjusted, there is little chance of over-flexing too, as the only pressure will be direct from the rider’s hands to the bit. German martingales can be a bit intimidating to a novice, as there are extra straps and adjustments to get used to, but overall they are very effective for teaching the mule to give to the bit. Another advantage to German martingales is that they do not limit lateral (sideways) movement of the reins. Used with a snaffle. A combination of running and standing, this martingale. Gives the effect of both of those. Used with a snaffle. A short piece of leather the length of the of the distance between the reins under a mule's neck. Rings on either end allow the reins to be passed through like the running martingale. Prevents the reins from being thrown around. Used with a snaffle. Fitted either with the reins running through the rider's hands, bit rings, and back to the girth (least severe position) or through the rider's hands, bit rings and down between the mule's front legs to the breast color (more severe setting), has the effect of teaching the mule to lower its head and round its frame. While this is very effective, lasting training only occurs when the rider teaches the mule to lower its head, tuck its nose, round its back and work off the hindquarters. This is not a control device in that a mule could easily run off or buck, both of which is helped by the lower head set. Used with a snaffle. The draw rein is actually on continuous rein that passes from the poll, down the sides of the face, through the bit rings from the outside to inside and straight to the rider's hands. This aid encourages the mule to raise his head by mimicking the action of a gag bit. Draw reins are useful with mules who get their heads too low, those inclined to buck, those who lean on the bit or those who like to slide the reins out of the rider's hands by lowering their heads. Used with a snaffle. This training aid encourages the mule to lower the head and neck thru poll pressure as well as the bit. Used during riding. This training device comes in handy during lunging and free work. It encourages the mule to lower and head and neck, round his back and stay in frame. The mule works corrects himself when he raises his head too high. Used with a snaffle. This is an extension of the Chamboon but used while riding. This training aid encourages the mule to lower the head and neck thru poll pressure as well as the bit. Used during riding. Used with a snaffle. This is another device used while lunging. It is a single rein that passes over the poll down both sides of the face through the bit, through the front legs, around the rib cage and tied at the withers. During exercise, the mule learns to round, lower his head and learn the rhythm of his own shoulders. Very effective. Used with a snaffle. Spurs are not instruments of torture, To the contrary, they are designed to simply reinforce or to apply leg aids more precisely. They can be used to get a mule's attention and to punish gently, but firmly. English type spurs are generally of the blunt type, while Western spurs generally have rowels with varying degrees of sharpness. Used in conjunction with other aids, crops, bats and whips are used to finish the message sent by the other aids. They can be used to provide additional pressure to an aid or to get the animals attention. They are significant in establishing communication while riding side saddle. They should never be used to beat the mule. Most mules who have had the crops and whips applied correctly have no fear whatsoever of the them. 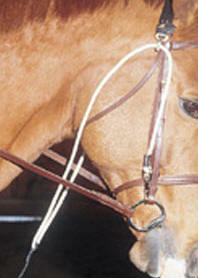 Nosebands are designed to keep the mule's mouth closed so that contact with the bit can be maintained. They come in a variety of types. They should not interfere with the mule's breathing nor should they be used with heavy hands. Nosebands are generally part English bridles but not western. Be sure and check rulebooks to see if they are considered legal equipment in the English classes you enter. They are illegal in all western classes except speed and cattle.